As we live together as disciples, we care for one another in times of need and significant changes in life. 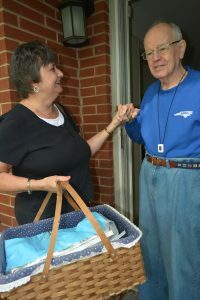 Check out several of our caring ministries -- and what we do for care at the time of funerals. This LifeGroup was founded by Lorna Reasor for widows ready to face the “next chapter” in the lives following the loss of a spouse. The group gathers at noon on the third Thursday of each month at Lorna’s home for lunch, fellowship and conversation. This unique ministry offers meal support in times of crisis. The group prepares ahead and freezes meals (entree + side) which are delivered as needed to homes of families with a member in the hospital or members recent released from the hospital for whom meal preparation is a substantial challenge.